General advice is not to turn UFH on for 2-4 weeks after laying tiles. I have used Kerakoll BioGel NO LIMITS Eco Friendly Flexible S1 Adhesive (White). The data sheet for this includes details for using it at 35°C and our UFH flow temperature is set at 37°C (in 50mm of screed). I'm getting pressure to get the heating back on.... given these temperatures do you think this is risky? 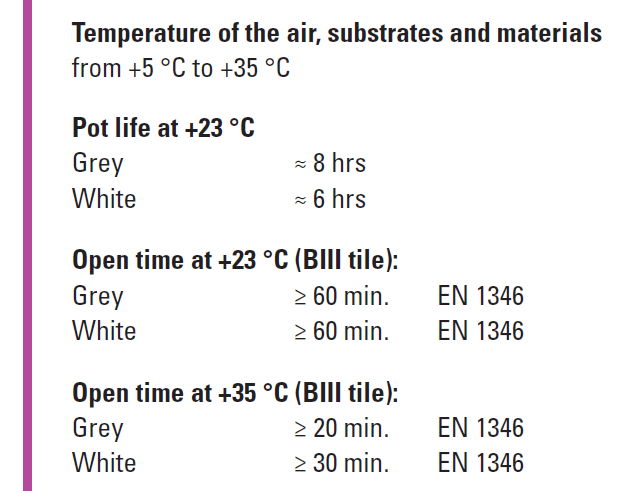 Depends very much on the UFH flow temperature and the surface temperature of the floor. For example, our UFH flow temperature is typically around 25 to 26 deg C and the floor surface temperature never goes over about 23 deg C, and those temperatures wouldn't be unusual for a non-UFH floor in warm weather in summer, so whether the UFH is on or not doesn't really matter at all as far as stuff like this goes. I'm pretty sure the manufacturers of flooring products in general are hyper-sensitive about UFH because of the way older systems in poorly insulated houses had to run at higher temperatures, but even then I'm far from convinced that UFH is a particular problem. We had an area of floor in our old house (which had radiators, not UFH) that used to get up to ~30 deg C or more when the sun was shining on it, which is a fair bit hotter than any UFH would heat the floor surface to (30 deg C is over 110 W/m² for a 21 deg C room temperature, way higher than UFH systems normally run at).